Foreign Minister Tilak Marapana, PC, yesterday, challenged the UN claim that 40,000 civilians were killed on the Vanni east front in the final phase of the war between January and May 2009. Marapana used the disclosure made by Lord Naseby in the House of Lords, on Oct 12, 2017 to dispute the UN claim. One-time Attorney General Marapana, also, strongly defended both retired and serving officers accused of war crimes. He asserted that there were no proven allegations of war crimes or crimes against humanity against individuals in the OISL report of 2015 or in any subsequent official document. Therefore, it was an injustice to deprive any serving or retired officer of the Sri Lankan security forces or the police of their due rights, Minister Marapana said. The leader of the Sri Lankan delegation to the 40th Session of the Human Rights Council Marapana said so at an interactive dialogue with the High Commissioner for Human Rights on ‘Promoting Reconciliation, Accountability and Human Rights in Sri Lanka. 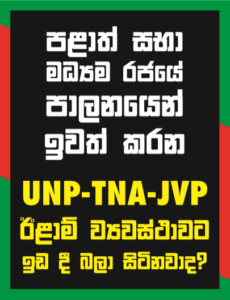 Since the co-sponsoring Resolution 30/1 on Oct 01, 2015, Sri Lanka has never challenged the UNHRC allegations. The delegation comprised UPFA National List MP Dr Sarath Amunugama, the Governor of the Northern Province Dr Suren Raghavan, Foreign Secretary Ravinatha Aryasinha and Deputy Solicitor General Nerin Pulle, and Permanent Representative Ambassador A.L.A. Azeez. Minister Marapana said: “There has been persistent and repeated reference in official documents of the OHCHR and this Council to exaggerated numbers as the alleged death toll during the last stages of the conflict. These assertions remain in direct contradiction to independent assessments sent by foreign missions, UN agencies as well as other international organizations, including the ICRC – and some heavily redacted accounts of which have been presented not only in the House of Lords in the UK on 12 October 2017, citing dispatches by the UK Defence Attaché in Colombo during the last stages of the conflict, but also in writings by academics and journalists which is found in the public domain. Minister Marapana dealt with the latest UN Human Rights Commissioner’s report.Asserting that the post-conflict milieu of each country was unique, Minister Marapana said: “There are no two post-conflict situations where similar prescriptive remedies can be applied. We can learn from others’ experiences but our own path to reconciliation will be primarily driven by the domestic context, in which we function. The basic tenet of a Transitional Justice process is the focus on its theoretical principles on State obligations. It is the State that must pursue Truth, Justice, Reparations and Guarantees of Non-Recurrence. Sri Lanka committed to such a process in 2015, and has been taking concrete action since, to move forward on these pillars. “In the area of Truth Seeking, an Office of Missing Persons (OMP) has been established by law and fully operationalised. The Cabinet of Ministers is currently considering draft legislation to establish a Truth and Reconciliation Commission. In the area of Justice review of cases under the PTA have taken place and trials under the PTA have been expedited, while consultations are ongoing in Parliament to replace the PTA with proposed legislation for Counter Terrorism (CTA) ensuring its conformity to international standards and best practices. As for Reparations, the Office for Reparations Act passed by Parliament in October 2018 has provided for the establishment of an Office of Reparations in terms of the said law and three Commissioners have been recommended for appointment by the Constitutional Council. These institutions are empowered to look into, ascertain, acknowledge and address complaints made to the same. It must be noted that statutory duties performed by such bodies have to accord with a process of fairness and rules of natural justice, in achieving the objectives in respect to which such bodies are established. To ensure Non-recurrence of conflict, we are firmly resolved to fulfilling the agenda on reconciliation. “In the context of paragraph 15, the institutions already established to take the transitional justice measures forward would require that they adhere to the rule of law, and the results of the work carried out by such institutions should be able to withstand the test of any potential judicial process. Thus, while appreciating the acknowledgment in the report that steps have been taken for institution building, it may be recalled that the benefits arising from the functions of such institutions that accrue to individual rights holders should accord with the principles of natural justice as decisions made in haste compromise on principles of natural justice. “In the context of paragraph 19, it may be noted that under the Reparations Act which was passed into law in October 2018, three Commissioners have been recommended for appointment by the Constitutional Council and in the 2019 Budget, the Government has allocated Rs. 500 million to pay a monthly allowance for families of disappeared persons who have received the certificate of absence. “With reference to paragraph 23 of the Report with regard to the discovery of human skeletal remains in Mannar on 29th May 2018, this matter is a case in point for the need to exercise caution in approaching issues of this nature. Contrary to pre-conceived notions, it was scientifically established that the recovered skeletal remains had no nexus to the conflict. Having been facilitated through the Office of Missing Persons (OMP), the test results obtained from a USA laboratory have revealed that the said skeletal remains date back to 1499-1719 AD – a period when Sri Lanka was largely under European colonial rule. This is yet another instance that demonstrates that allegations and mere collection of data should not be pre-judged to cast unjustified aspersions. It also amply demonstrates the need for allegations to always be subject to the due process of investigation in accordance with established legal procedures and not be hastily credited to support unfounded assumptions. “With reference to paragraph 25 of the Report, the amendments suggested by the Supreme Court to the content of the Bill on the “Office for Reparations” complies with the basic structure of our Constitution that recognizes a functional separation of powers pertaining to organs of government. The incorporation of amendments suggested by the Supreme Court, considered by the Parliament to make amendments to the Reparation Law, is a mandatory process that ensures the constitutionality of the said law. Furthermore, contrary to your observation , it may be noted that the proposed amendments suggested by the Supreme Court broadens its applicability to persons who could seek redress before the Office for Reparations, since complaints that can be received and considered, both individually and collectively by the Office, would no longer be limited to alleged violations of human rights or International Humanitarian Law, but would inter alia in terms of the definition provided in section 27 of the Act, include – persons who have suffered damage as a result of loss of life or damage to their person or property – such damage being in the nature of prolonged and grave damage suffered by individuals groups or communities of people of Sri Lanka. “At a time the world is confronted with increasing acts of terrorism and violent extremism, as I stated before this Council last year, the action by the Sri Lankan security forces during the conflict was against a group designated as a terrorist organization by many countries, and not against any community. The modus operandi of this terrorist group, which for the first time in recent history deliberately targeted civilians, has now been adopted by terrorist groups all over the world. All communities in Sri Lanka were united against terrorism, and now that terrorism has been defeated, all communities are working in unison towards reconciliation and economic progress. “Hence, in the context of paragraph 27 and 29, with reference to criminal accountability, it must be re-stated that Sri Lanka guarantees to all its citizens their rights in accordance with the constitutional and judicial process of Sri Lanka. However, the reference in the said paragraph to the abundant evidence that the ordinary criminal justice system is unable to deal with the nature of the allegations, and the complexity of the crimes is misconceived. On the contrary, the judicial system in Sri Lanka is adequately equipped to deal with complex crimes.. Criminal investigations pertaining to cases referred have been taken congnizance of by the investigating agencies to be conducted under established legal procedures and are periodically being monitored in terms of the judicial process. Any complex criminal investigation is time consuming. The acknowledgement in paragraph 20 of the report that ‘victim tracing procedures’ require thorough assessments in multiple areas and takes time, is an indicator that establishes the said assertion. It also negates the alleged inability of the Sri Lankan criminal justice system to deal with the nature of allegations and complexity of crimes. “With reference to paragraph 31, it must be noted that constitutional reform is a continuing process conducted in accordance with the procedures of Parliament, which has moved forward unimpeded notwithstanding other political developments in the country. This process requires addressing all issues relevant to the diverse populace of Sri Lanka and is necessarily embarked upon taking cognizance of the concerns of all stakeholders. “With reference to paragraph 32, it may be noted that the draft legislation with regard to the counter terrorism law had inputs from a multiplicity of stakeholders, as well as technical assistance from UN agencies, who were fully engaged in developing the proposed draft to ensure compliance with international norms and best practices. In this exercise, all stakeholders were afforded the opportunity to contest the contents of the proposed Bill before the Supreme Court of Sri Lanka, which was availed of by several parties. Accordingly, the contested sections have received consideration of the Supreme Court and its views on the contents of the Bill are now before the Sectoral Oversight Committee on International Relations in Parliament, where committed discussions have been held, including with civil society. It is also pertinent to note that certain segments of Sri Lanka’s civil society have advocated the repeal of the PTA and non-introduction of any further legislation to deal with terrorism-related issues. These matters that have been placed before the Oversight Committee of Parliament, have resulted in a further prolonged deliberation process in enacting the CTA. “With reference to the paragraph 35, Sri Lanka appreciates the recognition by the Council of the considerable efforts taken by GOSL in releasing lands held by the security forces. “As I pointed out in the Sri Lanka Parliament on 14th March 2019, I would like to emphasize that the data reflected in the High Commissioner’s report that only 75% of the land held in 2009 by the security forces has been released is at significant variance with the actual numbers. “Of the 71,172.56 acres of State lands held by the Security Forces, since May 2009, 63,257.48 acres have been released, as at 12th March 2019, i.e. a release of 88.87% of land originally held. “Of the 28,215.29 acres of the private land held by the Security Forces since May 2009, 26,005.17 acres (92.16%) have been released as at 12th March2019. “However, the remaining lands, which are a necessity in the context of national security, would continue to be held by the security forces, with compensation being paid in respect of privately owned lands. “With reference to the concern raised on the alleged destruction of property before return, it needs to be categorically stated that there is no such government policy. On the contrary, the security forces have dismantled military infrastructure before the handover in the interest of the safety and facilitation for civilians. “It must also be noted, Madam High Commissioner, that the Government of Sri Lanka has no policy of “Colonization” of either the Northern Province or Eastern Province, or as a matter of fact, of any province in the country. As regards the contention that land owners are deprived their land by declaring their land as forest cover or as archeological projects, it must be clearly and categorically stated that the Government has not resorted to any such measures. However, it must be born in mind that the protection of forest land and archaeological projects is an obligation cast on any State in accordance with its international obligations that mandate protection and preservation of the environment and of cultural heritage. Furthermore, in identifying the relevant forest land and the cultural heritage, respective provincial administrations are also consulted. “While fully acknowledging the mandate of this Council in the prevention of human rights violations and responding promptly to human rights emergencies around the world, Sri Lanka believes that this Council knows only too well the comparative experiences of countries which have traversed the path of post-conflict transition and reconciliation. These countries have often made deliberate efforts to maintain a careful balance between the speed of the transitional justice process and the desired quality, inclusiveness, comprehensiveness and sustainability of the outcomes. This is particularly true for countries like Sri Lanka, where unlike in certain other post-conflict situations, the challenge is not one of ‘State building’, but of ‘peace building’. The Government of Sri Lanka is committed to finding effective and culturally sensitive and viable practices of healing and social co-existence. “However, the considerable unevenness in the standards of proof applied to the Government of Sri Lanka, compared to those applied to the unsubstantiated allegations made by Sri Lanka’s detractors is problematic and confounding. In this context, the Mannar graves referred to in para 23 of the High Commissioner’s Report and elaborated earlier is a case in point. While this report may have been compiled over several months ago, at the time of its release, a determination on the dating of the remains had already been made based on forensic evidence. We do not see this important detail included in the report. Moreover, the report presupposes “other mass graves might be expected to be found in the future”. An assumption of this nature in a public report, on a matter of this magnitude and seriousness, is not acceptable, and may even cast a doubt as regards other assertions in the report. “Conventional wisdom teaches us that when facts do not fit a theory, the theory has to change. However, conventional wisdom does not seem to be applied to Sri Lanka’s case. It seems that even if the theory is disproved through hard evidence that absolves Sri Lanka, as in the case of the Mannar graves, a matter in which some sceptics sought to implicate the Government of Sri Lanka, such facts are cast aside for further inquiry. “At the same time, as stated earlier, when evidence surfaces, which contests the culpability of the Sri Lankan security forces and police in having deliberately caused civilian casualties during the last phase of the conflict, this evidence is summarily disregarded. “The Government of Sri Lanka at the highest political levels, has both publicly and in discussions with the present and former High Commissioner for Human Rights and other interlocutors, explained the constitutional and legal challenges that preclude it from including non-citizens in its judicial processes. It has been explained that if non-citizen judges are to be appointed in such a process, it will not be possible without an amendment to the Constitution by 2/3 of members of the Parliament voting in favour and also the approval of the people at a referendum.